What is the best cover crop species to use following wheat and other crops harvested in late summer? Cover crops can help improve soil structure, protect the soil from erosion, feed soil life, suppress weeds, cycle nutrients, provide feed for livestock and much more. Cover crops are not a magic solution for your soil problems, but when combined with other good soil management practices they can help improve soil health. Red clover is still the best cover crop option in winter wheat as it provides a nitrogen credit to the following crop and produces significant top (3600 kg/ha by mid-October) and root growth. As well as an 80 kg/ha nitrogen credit for the following crop. If red clover is not an option or did not establish, then planting cover crops following a cereal crop is the next option. Many think that volunteer cereal growth is good enough, but a planted cover crop can provide up to five times the above ground biomass and root growth. It can also suppress weed growth, which volunteer cereal growth cannot do. The cover crop chosen for a field will depend on why you want to grow the cover crop. You will also need to consider how it will fit into your cropping and tillage system and how much time there will be for the cover crop to grow. The OMAF and MRA website http://www.omafra.gov.on.ca/english/crops/pub811/8building.htm#cover (in the soil management section) provides comprehensive information on cover crop species selection and management. The “Agronomy Guide for Field Crops”, OMAF and MRA Publication 811 also has cover crop information. 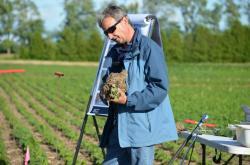 The Midwest Cover Crop website http://www.mccc.msu.edu/selectorINTRO.html provides an Ontario cover crop selection tool. Following cereals, or any other crop, plant the cover crop as soon as possible to achieve the most growth. Another great opportunity to plant cover crops is following corn silage harvest, as there is little cover left to protect the soil. Annual cover crops can be planted up until six weeks before a killing frost is expected. After that point a winter cereal is the best option. If volunteer cereal growth is present, consider whether or not to spray it to prevent it from competing with the cover crop. Ensuring that the straw was spread well at harvest will improve cover crop establishment. A drill, planter or air-seeder can be used. Cover crops can be no-tilled, or tilled and then planted. Placing the seed in the ground will provide the best opportunity for quick establishment. Seed can also be flown on, broadcast or broadcast and worked in, or applied with a liquid manure application. Table 1 includes some suggested options. Single species are simple. More complex mixes have been gaining favour. The following will achieve good ground cover at a reasonable cost. The spring cereals and the brassicas require nitrogen to grow just like corn and cereals we grow for grain. If manure has been applied then there will likely be enough nitrogen for good cover crop growth. If the cover crop is following a winter wheat crop then there may be very little growth without adding 30 to 50 lbs/acre of nitrogen. Legume cover crops should be inoculated if they haven’t been grown in the field before. Before planting a cover crop it is important to think about what management it may require. Many cover crops are killed by frost and don’t require a herbicide treatment. Others will survive the winter and will need to be killed in the fall or spring. Some will go to seed, so they will need to be mowed or managed before then. Tillage, using a roller crimper or grazing are other methods that can be used to manage or terminate the cover crop.